Home Maserati Quattroporte GTS V8 Maserati is recalling its 2014 Quattroporte GTS V8 for a possible defect that can cause the wiring harness to overheat and cuase a fire. Maserati is recalling its 2014 Quattroporte GTS V8 for a possible defect that can cause the wiring harness to overheat and cuase a fire. 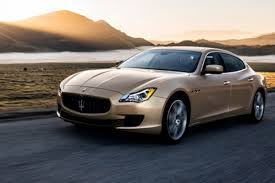 Maserati North America, Inc. (Maserati) is recalling certain model year 2014 Quattroporte GTS V8 vehicles. The affected vehicles have an improper Y-connection crimp in the alternator-starter motor wiring harness. The improper crimp could cause the the battery positive cable to short to ground which may cause the the wiring harness to overheat and result in a fire. The car also may stall, increasing the risk of a crash. Got a lemon Maserati Quattroporte ?